In the last post [Part 1/2], we prepared our VSA, created a management group and cluster in the CMC, and then initialized our disks. 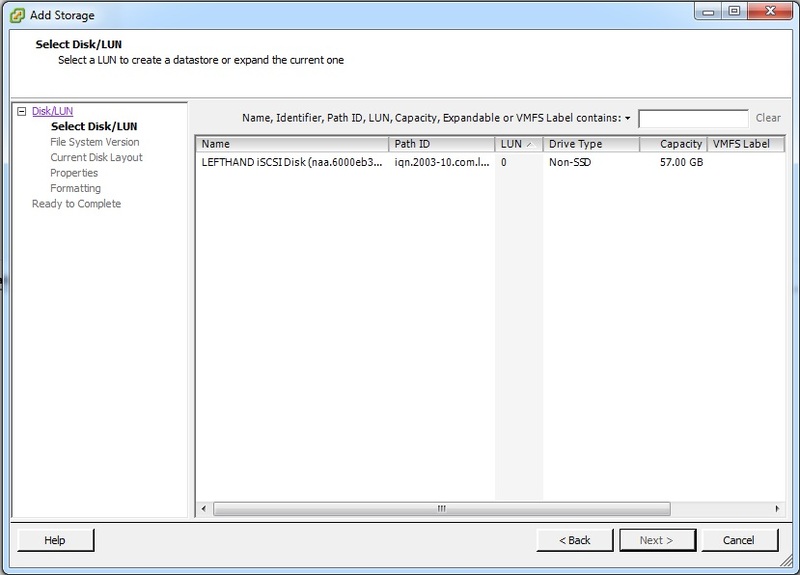 Next up, we’ll be creating a Volume which will be presented to our ESXi hosts as an iSCSI LUN. Before we do this though, we need to make sure our hosts can see this LUN. Therefore we’ll be making entries for each of our ESXi hosts using their iSCSI initiator names (IQNs). 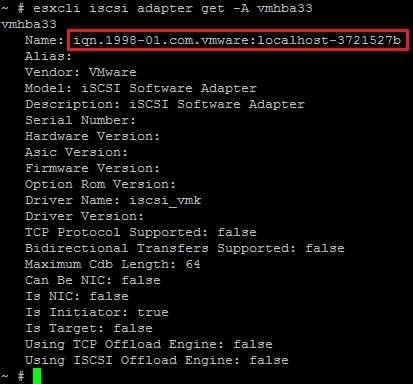 If your ESXi hosts don’t already have a dedicated iSCSI adapter you’ll need to use the VMware Software iSCSI adapter. 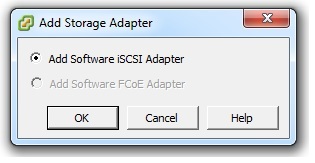 By default this not enabled in ESXi 5.0. This is simple to fix – we just need to get it added. Select your first ESXi host in the Hosts & Clusters view of the vSphere Client, and click Configuration -> Storage Adapters -> Add -> Select “Add Software iSCSI Adapter”. Click OK to confirm. Now we need to find the IQN of the iSCSI adapter. 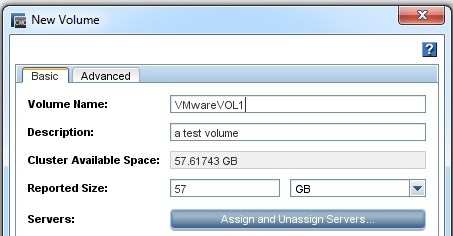 In the vSphere client, select the iSCSI adapter you are using and select Properties on it under Storage Adapters. This will bring up the iSCSI Initiator Properties. 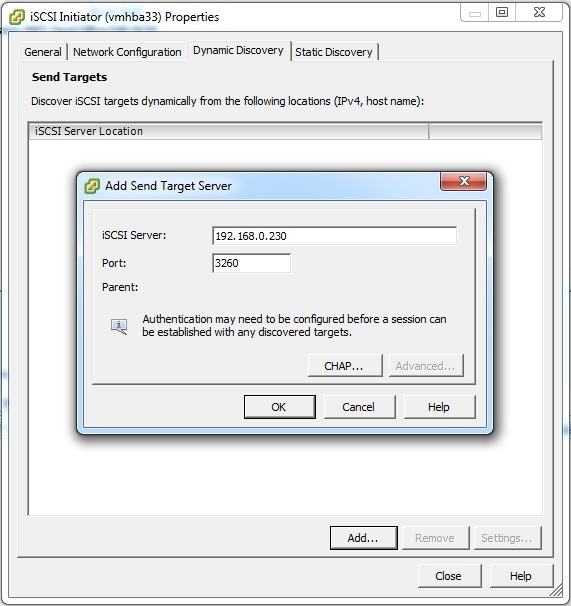 Click the Configure button and copy the iSCSI Name (IQN) to your clipboard. We’ll now create “Servers” in the HP CMC which are what we’ll be adding to our “SAN LUN” later on to allow our ESXi hosts access. In the CMC go to Servers and then click Tasks -> New Server Cluster. Give the Cluster a name and optional description, then click New Server. 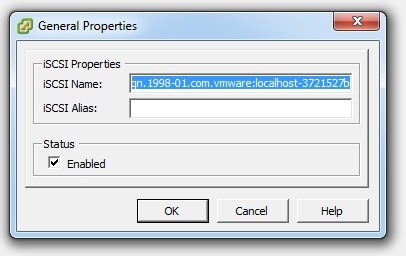 Enter the details of each ESXi host (Click New Server for each host you have in your specific cluster). 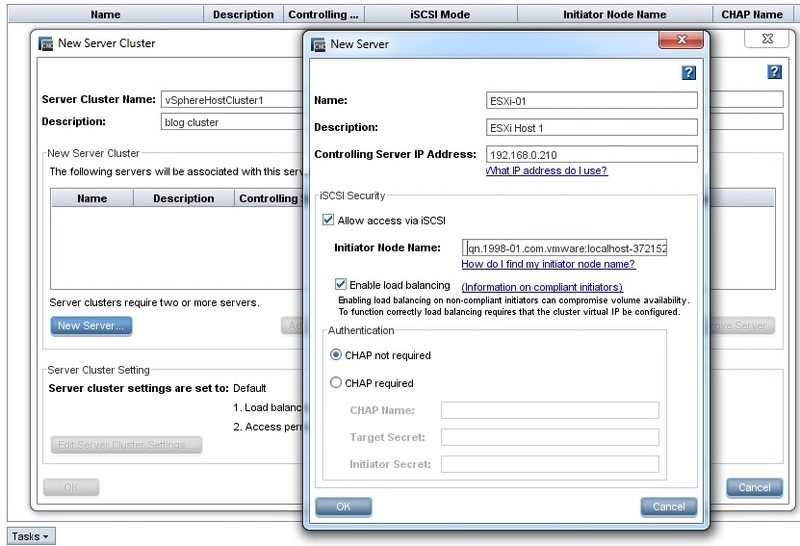 For each ESXi host, the Initiator Node Name is the iSCSI Name, or IQN we got from each ESXi host in the step above. The Controlling Server IP Address in each case should be the IP address of your vCenter Server. For this example we won’t be using CHAP authentication, so leave that at “CHAP not required”. Once all your ESXi hosts are added to the new cluster, click OK to finish. Enter a Volume Name and Reported Size. You can also use the Advanced Tab to choose Full or Thin provisioning options, as well as Data Protection level (if you had more than one VSA running I believe). Go back to the vSphere client, go to one of your ESXi hosts, and bring up the Properties for your iSCSI adapter once again. We’ll now use “Add Send Target Server” under the Dynamic Discovery tab to add the IP address of the P4000 VSA. Click OK then Close once complete. You should be prompted to Rescan the Host Bus Adapter at this stage. Click Yes and the Rescan will be begin. After the Scan is complete, you should see your new LUN is being presented as we’ll see a new device listed under your iSCSI Adapter (vmhba33 in my case for the Software iSCSI adapter). Now that everything is prepared, it is a simple case of creating our VMFS datastore now from this LUN for our ESXi hosts to use for VM storage. 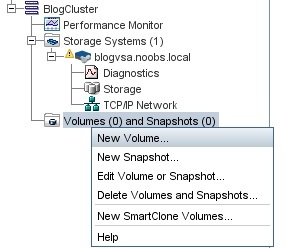 Under Hosts & Clusters in the vSphere Client, go to Configuration, then Storage. Click Add Storage near the top right, and follow the wizard through. You should see the new LUN being presented from our VSA, so select that and enter the details of your new Datastore – Capacity, VMFS file system version and Datastore Name. Finish off the wizard and you are now finished. The new datastore is created, partitioned and ready to be accessed! To conclude, I hope this series has been helpful and that you are well on your way to setting up iSCSI shared storage for your VMware Cluster! As always, if you spot anything that needs adjusting, or have any comments, please feel free to add feedback in the comments section. 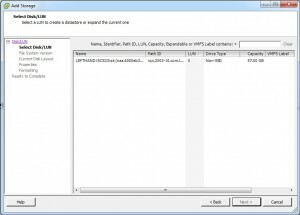 Can you configure a ESXi 4.1 host through iSCSI to connect to two seperate/isolated Lefthand systems?. I have one system running SAN/iQ 8.3 and another system running SAN/iQ 9.5 and I do not want to join them or cluster them together, but I want to storage vMotion all VMs and vmdks etc from the 8.3 system to the new 9.5 system for contingency so I can totally rebuild the 8.3 system and then when there are at the same SAN/iQ version i.e 9.5 bring all four nodes together under one system managed by a single CMC. Was not sure whether ESXi 4.1 would let its single initiator [ 1 vswitch and two NICs ] point to two seperate Lefthand systems and hence two VIPs ?. Apologies for the late reply! At first thought I believe this should be possible. I’ll see if I can try it out in my lab. What I have tried and confirmed to work is two different VSA appliances in two different Storage Clusters (each in their own) with two VIPs, one for each, connecting to the same ESXi hosts. However this was under the same CMC. Is that what you are looking at doing? Apologies for my late reply also Sean. I have managed to work out the best way forward without having to install SANiQ 8.3 / 9.5 coexistence patch. I configured the two new P4500 G2s in a seperate Array [cluster] managed by a seperate 9.5 CMC. all on the same subnet with 2 different VIPs. Now I have configured ESXi hosts to iSCSI connect to both sets of LUN targets on both clusters thro VIP dynamic discovery. This has now enabled me to svMotion all VMs residing on 8.3 based cluster to the 9.5 based cluster. I will now upgrade the 8.3 based empty cluster nodes, kill the 8.3 CMC and add the upgraded nodes now at 9.5 to the new 9.5 based cluster. A single cluster with 4 nodes and 1 CMC all at SANiQ 9.5. During the svMotion stage and coexitence through ESXi connectivity, both CMCs will see both arrays [clusters] as the arrays are broadcasted across the same subnet, so ensure the management is orchestarted thro the 9.5 CMC as the 8.3 CMC will not maange the 9.5 nodes. Thanks for you reply Sean as your article inspired me to find a solution that guaranteed a smooth merging of P4500 nodes. Thanks for leaving that info here! Great to see you are on your way to finishing up the configuration and change. Hope all has gone well. I had a feeling the two VIPs (one for each cluster) could work – excellent stuff! I have a 2 x HP4500 connecting to 2 x esx servers. Also we thought of setting up the DR.
What do i need to manage all in one location? Do i need snapshot luns? How do i setup replication? Hmmm, that is a tricky question, and it all depends on how your networking is setup between sites. Would be best asking that on a network orientated forum or messageboard to be honest! You’ll need to allow comms through the VLANs of course and need some routing in there. Regarding the snapshots and replication – I haven’t actually tested these features on the P4xxx systems myself – sorry I can’t be of much more help than that.